Where Marie gets her wool Most of her wool comes from her own sheep, though she trades wool with family members to broaden her color choices. Yarn needed for a typical rug Marie's rugs approach "tapestry" quality, running 50 to 60 weft threads per inch. The rug now on her loom, roughly 3 by 5 feet, could well use a quarter-mile of yarn. Favorite flour "Blooms in Your Oven" and "White as Snow" say the sturdy cotton sacks of White Rose flour lying around Marie's house. Marie and other weavers re-use the sacks to store wool or deliver rugs. It's a small sign in a big landscape. "Burnham" is all it says. On a gray morning of ground blizzards, a casual traveler could easily miss it. Not that casual travelers are frequent in January on U.S. 491 north out of Gallup, N.M. -- and not that Mary Jane and Jackson Clark are casual travelers. The two, mother and son, have traveled this northeastern corner of the Navajo Nation for decades buying rugs for Toh-Atin, their Indian arts gallery in Durango, Colo.
Today, they are visiting Marie Begay, a particular favorite of theirs because of her fine work. Marie follows the old ways of shearing, carding, spinning and weaving wool from her own sheep. To reach her home requires a long drive on rutted roads past the roofless ruins of the old Burnham trading post, past a Navajo chapter house, through miles of treeless winter landscape. Finally, there on the left is the icy track to the small gray house Marie's husband, Matthew, built for her and their six children. Heat radiates from the Begays' new pot-bellied coal stove this cold morning. Marie's daughter, Shawnda, wears jeans, but her mother, dark hair pulled back from her plump face, wears a long skirt, and her plaid shirt is fastened with a fine turquoise pin. "I lack the patience for weaving," admits Shawnda. But she patiently translates, helping questions in English make their way into Navajo and bringing the answers back again in English. Marie brings out an album of family photographs, and explains that her mother died young, so her grandmother taught her to weave. Her grandmother was a strong and striking woman, judging by a sepia photograph labeled "born 1870, died 1976." When she finished a rug, she'd ride off to the trading post on horseback and bring home gunnysacks full of supplies. Marie began to weave when she was 9, her first piece no bigger than the photo album. Though she never went to school, she made sure to send all her children. Daughters Theresa and Julia both learned to weave, but now Theresa is an accountant and Julia is a teacher. Granddaughter Brandy has an artistic streak but, 13 years old and living in Albuquerque, is less interested in weaving than in playing soccer. Marie demonstrates the laborious stages of making a rug. In a small concrete-block building east of her house, warmed by another pot-bellied stove, stands a traditional vertical Navajo loom. Marie has begun a large piece in her trademark browns, grays, deep black, and the snowy white she gets by washing wool with alkali. Sacks of wool sheared from the Begays' sheep, rough and dirty, are stacked near sacks of cleaned wool, carded wool and handspun yarn. Marie uses wood-handled carders to transform unruly curls into airy fiber she can spin. She spins on her right side, one hand turning the long wooden spindle against her leg as the other hand draws out thin strands of wool. The piece now on the loom is one Marie began around Christmas. Its design was entirely complete in her head before she sat down to weave. It will take her about a month to finish and some days after that for her hands to heal from the work. Her weaving sells for more now than when she began -- but then again, she notes wryly, $10 used to buy a lot more. "My mother loves Wal-Mart!" says Shawnda, so they drive to the Wal-Mart in Farmington to buy the White Rose flour, clothes, glasses and shoes Marie's weaving earns. Electricity arrived at Marie's house just six years ago. 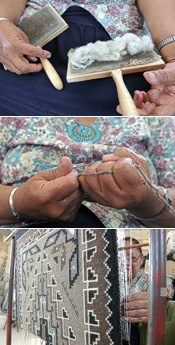 Today, community colleges teach Navajo weaving, and entrepreneurial weavers sell their work on the Internet. But the beauty of Marie's work sets it apart. It continues a tradition of craftsmanship all the more remarkable for the remote and rugged setting in which it arose -- and all the more rare in today's world of computers and crowded Wal-Marts. The author is a freelance writer based in Denver. This story was funded by a grant from the McCune Charitable Foundation.